Row 10 - (Divide for armholes) ch2, 1hdc in each of next 13sc, 2hdc in next sc, skip 24sc, (armhole) 2hdc in next sc, 1hdc in each of next 32sc, 2hdc in next sc, skip 24sc, (armhole) 2hdc in next sc, 1hdc in each of next 14sc. Turn. Pattern Row 1 - ch5, * skip 2dc, 1sc in centre dc of 5dc group, ch2, skip 2dc, 1dc in next sc, ch2, * rpt from * to * to end. Turn. Pattern Row 2 - ch1, 1sc in base of ch1, * skip ch2 space, 5dc in next sc, skip ch2 space, 1sc in next dc, * rpt from * to * to ch5, 1sc in 3rd of ch5. Turn. Pattern Rows 1 & 2 form the pattern, rpt rows until eleven 5dc group rows have been worked in all working 3sc in 3rd of 5ch on last row instead of 1sc, work should measure approx 10.5 Inches from shoulder. DNT. Back Edging - With RS facing work 39sc evenly in row ends up first back edge, 3sc in corner, working along cast on edge work 1sc in each of the starting ch around neck, 3sc in corner, work 39sc evenly in row ends down second back edge. Turn. Second Row - ch1, 1sc in base of ch1, 1sc in each sc up first back edge, around neck and down second back edge, working 3sc in corners. Fasten off. Third Row - Join in contrast color yarn, ch1, 2sc in base of ch1, 1sc in each sc to neck edge, work (1sc, 1sl st) in corner, sl st in each sc around neck edge to next corner, work (1sl st, 1sc) in corner, 1sc in each sc down back edge to next corner, 3sc in corner, working along bottom of dress, work 1sc in row end of back edging, sl st in next sc, * 1sc in each of next 2dc, 3sc in centre dc of 5dc group, 1sc in each of next 2dc, sl st in sc, rpt from * to * end, 1sc in row end of back edge, 1sc in corner, sl st to first sc on beginning of row. Fasten off. Next Row - ch1, 1sc in base of ch1, 1sc in each hdc to end, sl st to first sc on beginning of row. Turn. (26sc) Fasten off. Next Row - Join in contrast color yarn, ch1, 1sc in base of ch1, 1sc in each sc to end, sl st to first sc on beginning of row. Fasten off. a bow on the back of the dress, attach decorative buttons on front of yoke. 3rd Row - (Inc Row) ch3, 1dc in base of ch3, 1dc in next dc, * 2dc in next dc, 1dc in next dc, * rpt from * to * to end, sl st to top of ch3 on beginning of row. 4th Row - (Inc Row) ch3, 1dc in base of ch3, 1dc in each of next 2dc, * 2dc in next dc, 1dc in each of next 2dc, * rpt from * to * to end, sl st to top of ch3 on beginning of row. (51dc + ch3). 5th - 11th Rows - ch3, 1dc in each dc to end, sl st to top of ch3 on beginning of row. Turn after 11th Row. Row 2 - Work through both loops of stitch from now on, ch5, * skip 2dc, 1sc in centre dc of 5dc group, ch2, skip 2dc, 1dc in next sc, ch2, * rpt from * to * to last 5dc group, skip 2dc, 1sc in centre dc of 5dc group, ch2, sl st to 3rd of 5ch on beginning of row. Turn. Row 3 - ch1, 1sc in base of ch1, * skip ch2 space, 5dc in next sc, skip ch2 space, 1sc in next dc, * rpt from * to * to last sc, work 5dc in last sc, sl st to first sc on beginning of row. Turn. Rpt Rows 2 & 3 once or until brim measures approx 2 Inches. Fasten off. With RS facing join in contrast color yarn to first sc with a sl st, work * 1sc in each of next 2dc, 3sc in centre dc of 5dc group, 1sc in each of next 2dc, sl st in sc, rpt from * to * end, sl st to sl st on beginning of row. Fasten off. Rejoin contrast color yarn to loose loops on bottom of brim, ch1, 1sc in base of ch1, 1sc in each loose loop to end, sl st to first sc on beginning of row. Fasten off. Finishing - Sew in and tie off loose ends of yarn, with contrast color ribbon make a bow on the front of the hat. 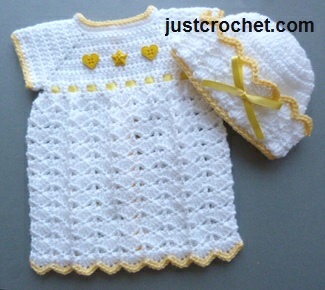 Hope you enjoy this free baby crochet pattern for a preemie dress and hat.